James (Jay) and Megan Spence met through a mutual friend, quickly hitting it off and planning their second date. For his proposal, Jay took Megan to lunch for a quick picnic at a nearby park. After finishing lunch, before she had to head back to work, she collected her things and turned to find him on one knee with a ring. One of Megan's favorite memories of her wedding day was before she'd even left her parents' house that morning. Jay made all her girls promise to get Megan to open his gift; upon opening it, she found a canvas print of the moment he proposed 10 months prior. She'd had no idea he had someone taking photos of the moment! 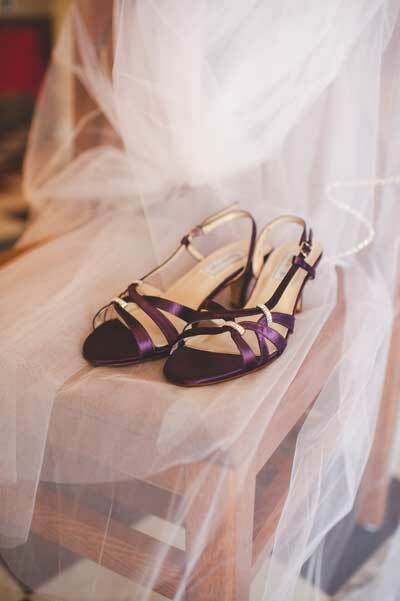 Megan best describes her wedding as "country boy meets city girl," with a rustic feel and plum and grey color scheme. 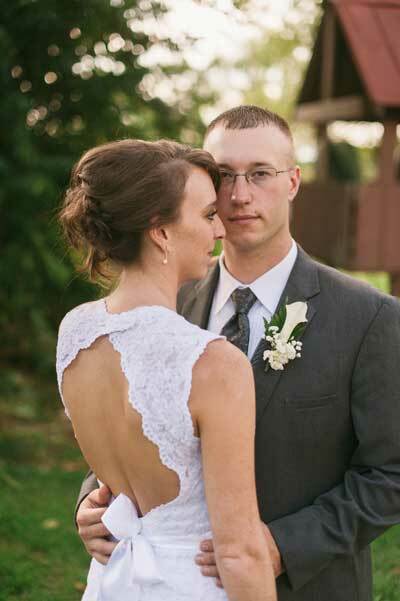 Megan wore her mother's wedding veil as her something old; her grandmother's earrings for something borrowed; a thin blue line around her garter to represent her future police officer husband for something blue; and of course her dress was something new! Centerpieces were flower cans that the couple made themselves. Each table also had a fact about them, their life together, and explanations of other details throughout the wedding. 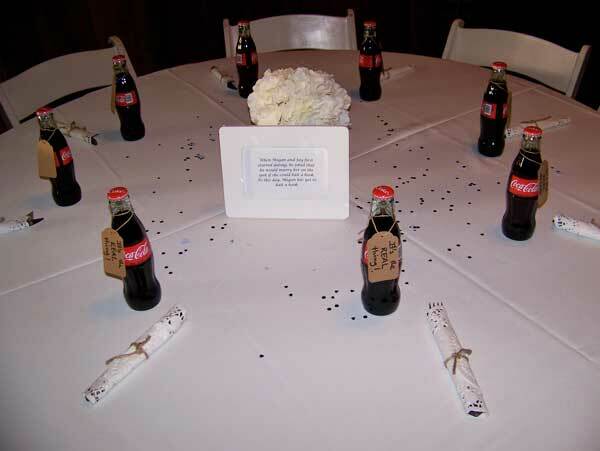 Another one of Megan's favorite personal touches was the Coca-Cola glass bottles at each table setting, as Jay's favorite drink is a good cold Coke! Tags went on each bottle with "It's the Real Thing!" Because Jay is a police officer, Megan wanted to do something to recognize him. Instead of a traditional groom's cake, she got donuts (after asking Jay it was okay!) and placed two small wooden police cars by the stand so guests understood the meaning. Their cake was also special because Jay made the cake base - he cut the stump, sanded and stained it, and even included legs so it'd stand evenly. 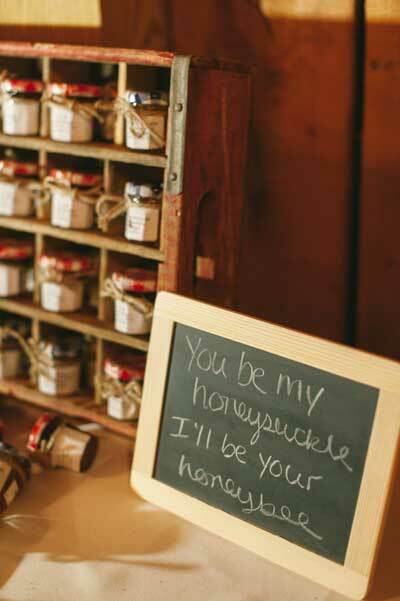 Guests were given favors of small honey jars, as well as little jam jars with twine and homemade labels. Mr. and Mrs. Spence traveled to St. Lucia for their honeymoon, staying at Sandals La Toc resort. Megan was especially excited to get away from interruptions and enjoy her vacation, including getting Jay on a plane for the first time. Be sure to see the Spence wedding on page 78 of the second issue of bridebook, on newsstands now!